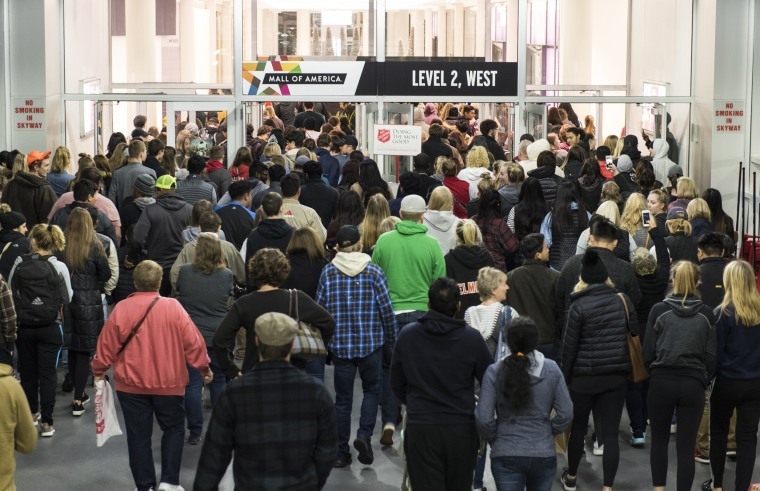 Shoppers had spent more than $1.52 billion online by Thanksgiving evening, and more bargain hunters turned up at stores this year as retailers opened their doors early on the eve of Black Friday. At the start of the holiday season, consumer spending rose 16.8 percent over the year before until 5 p.m. ET on Thursday, according to Adobe Analytics, which tracked 80 percent of online transactions at the top 100 U.S. retailers. Surging online sales and a shift away from store shopping have thinned the crowds typically seen at stores on Thanksgiving evening and the day after, known as Black Friday, for the past two years. But a strong labor market, rising home prices and stock markets at record highs have improved shopper appetite this year. Shoppers hit the malls -- Black Friday bust, or the return of retail? Moody’s retail analyst Charlie O’ Shea, who was in Bucks County, Pennsylvania, reported healthy traffic at local stores, including consumer electronics chain Best Buy, clothing store Old Navy and retailer Kohl’s Corp.
“The weather is cooperating and people here are out,” he said. In Birmingham, Alabama, the Riverchase Galleria mall was shut down early Thanksgiving night after several fights broke out inside, AL.com reported. Reports of gunfire quickly spread on social media, but local authorities said the reports were not confirmed and no one was shot. Police did receive calls reporting gunfire, but responding officers said they believed the sound was from fireworks, police officials told AL.com. A witness told local Fox News producer Steffany Means that a baby was hit by a shoe that was tossed over a railing, Means said in a Facebook post. Police made no arrests. The National Retail Federation is projecting that sales for November and December will rise by 3.6 percent. Non-store sales, which include online sales and those from kiosks, are expected to rise as much as 15 percent, to about $140 billion. In New Jersey, around 50 people lined up a Macy’s at the Westfield Garden State Plaza mall before it opened and around 200 people stood outside the Best Buy store, many to pick up their online orders. “Me and my husband have a bigger place and we need a bigger TV for the living room,” said Jenipher Gomes, who bought a 50-inch Samsung TV at Best Buy for $399.99. Shopper Hammad Farooq said he waited at the store for an hour to shop for laptops and monitors. In Chicago, shoppers appeared to be slightly less enthusiastic to emerge from their turkey slumber and crowds were thin along the city’s popular shopping destination, State Street. The holiday season, spanning November and December, is crucial for retailers because it can account for as much as 40 percent of annual sales. The number of customers shopping on their smartphones surged, accounting for 46 percent of the traffic on retail websites, while traffic from desktop and laptop computers declined 11 percent and nearly 6 percent respectively, according to data from Adobe.